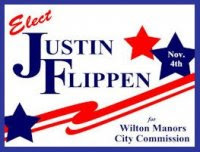 Justin Flippen who is running for Wilton Manors City Commission, Florida, has won the endorsement of U.S. Rep. Debbie Wasserman Schultz according to a Sun-Sentinel.com article. Rep. Wasserman Schultz is a member of the House Sub Committee on the Judiciary: Constitution, Civil Rights, and Civil Liberties. You may wonder, why does kelli in Dallas care so much about Broward County, Florida? Waymon Hudson’s Fight OUT Loud slapped us with the question “Wheres The RAGE?” and helped us out of our post traumatic shock after the Lawrence King tragedy. Waymon and friends have remained vigilant, a true T friend, sounding an alarm when the White House was being spirited away by someone who figured out how to us paper chafe to insure a Republican stayed in the white house 4 four more economy busting, war waging, liberty crushing years. Our LGBT family in south Florida have remained vigilant. They have let us know about Justin. Flippen is a good man. Justin Flippen has invited us to a fund raiser so he get this thing kicked off! Thanks for passing along the news about Justin Flippen, Kelli! Justin, who is President of the LGBT Democratic group here in South Florida, has been a true ally and friend to the trans community here in South Florida. He has been by our sides as we fought to expand protections and anti-discrimination laws to include gender identity and expression in Broward County. He has joined the fight as we pushed for change after the sensless murder of Simmie Williams. I am proud to call him a friend and ally.